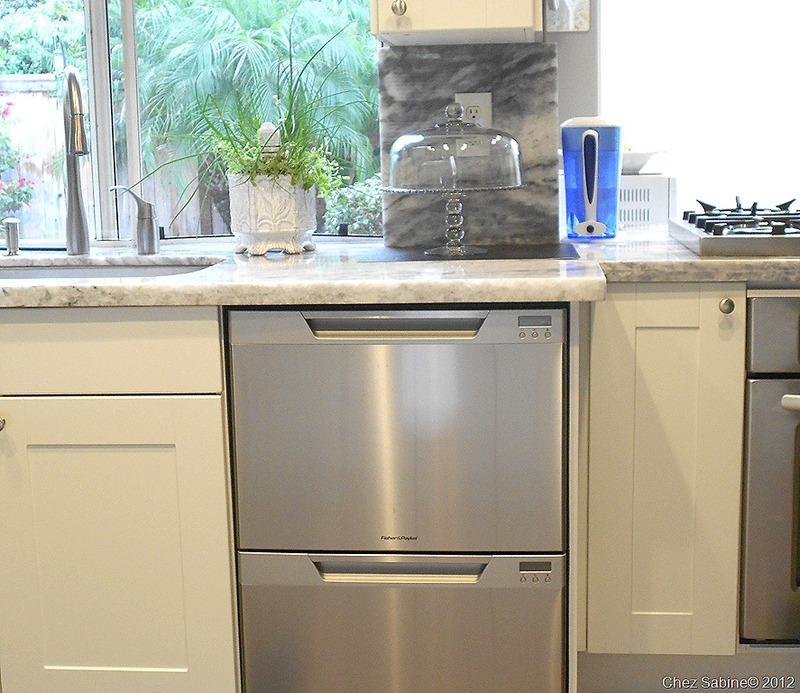 While I appreciate the convenience and handsome looks of my stainless Fisher & Paykel double drawer dishwasher, the interior is a little embarrassing. 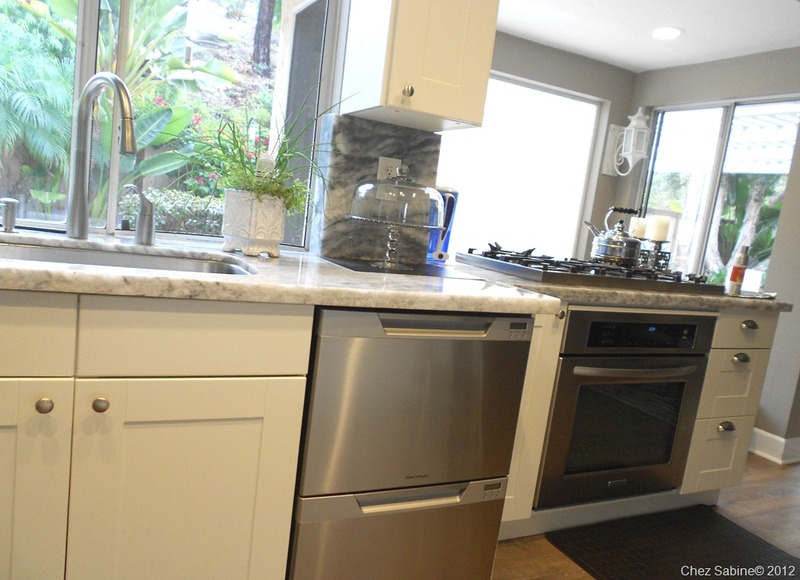 On the other hand, the exterior is the most hassle-free stainless steel appliance I have. 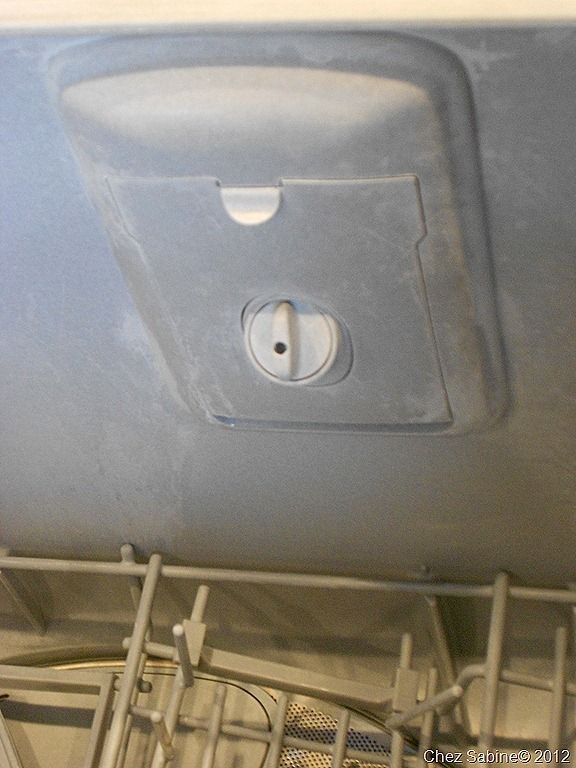 For some reason, and I’m really grateful for this, the finish on the dishwasher doesn’t gather fingerprints and smudges. Unlike the fridge, for instance. Just think about touching it and prints will fly from your fingers directly onto the stainless steel. 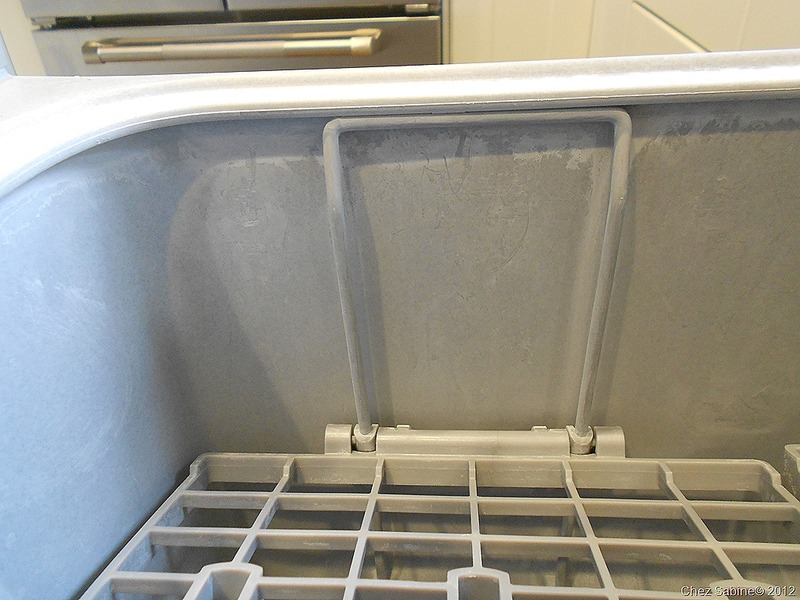 Sure, the outside remains pristine, but inside the dishwasher’s drawers, it’s another matter all together, especially the top one, which is the drawer that’s used the most. Check out the residue. Not pretty. A lot of the blame can go to hard water, and I’m in the process of looking for a dishwashing detergent with a high phosphate content, which is supposed to soften water. We’ll see. While I could opt for vinegar to clean the dishwasher’s interior, I really dislike using vinegar as a cleaning agent. I’m sure it works, but as much as I love to use it in salad dressings, I can’t stand the idea of my house smelling like vinegar. If you have a better tip that doesn’t include vinegar, I’m happy to listen. In the meantime, I found myself looking at cleaning products specifically made to clean dishwashers. I picked one up that didn’t sound toxic and put it to the test. My results follow. Lemi Shine Machine Cleaner for washing machines (including high-efficiency models), dishwashers and disposals, about $3 for a package of three single-use pouches. Available at Walmart, Target, major grocery stores and some hardware stores. First look: The label on the small yellow-and-blue box promises that Lemi Shine cleans, deodorizes and optimizes. Lemi Shine is phosphate free, septic system friendly and made with real fruit acids, natural citrus oils and sodium bicarbonate. Essentially, we’re talking about an antacid for your dishwasher. Good news: Lemi Shine is easy to use. 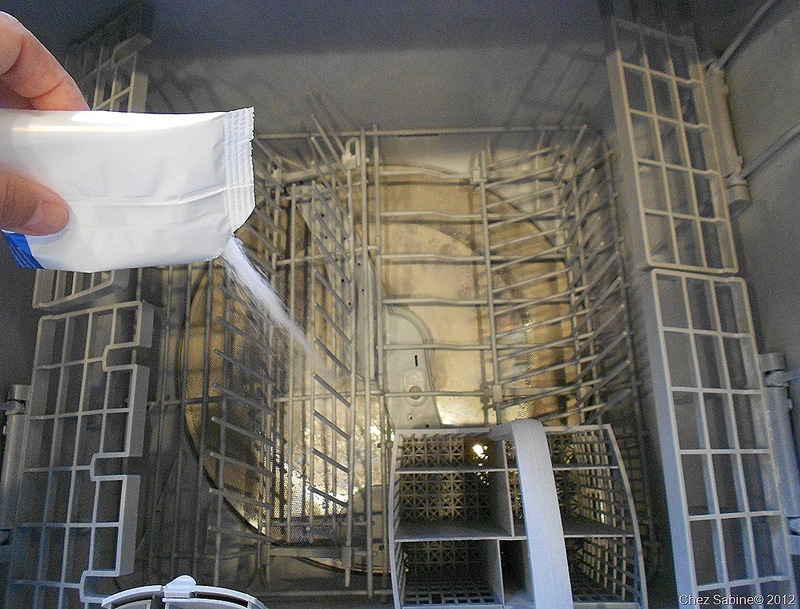 For the initial treatment – not to be confused with monthly maintenance – simply snip a corner of one of the pouches and pour the powder onto the bottom of your dishwasher. Turn on your machine and allow the cycle to run for 2 to 5 minutes, I chose the latter. After that time, pause the cycle. 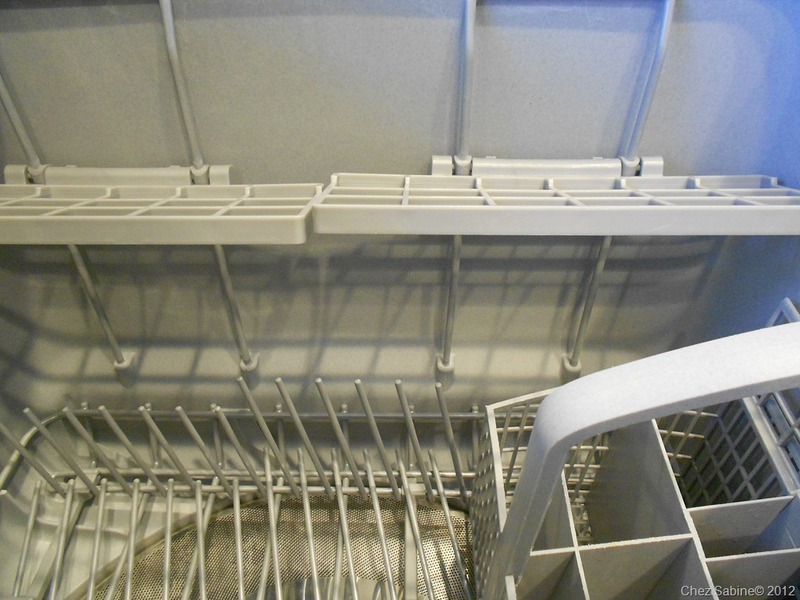 The idea is that the inside of your dishwasher will be all nice and wet, and the powder can do its job. Leave it on pause for 4 hours. Afterward, resume the cycle. See? There’s no real effort on your part, and Lemi Shine emits no odor as it works. And it did work. My dishwasher doesn’t quite look showroom new, but pretty close. Check it out. First, please endure the obligatory before shot. As you can see, there’s quite a bit of difference in these shots. Bad news: A minor quibble. Lemi Shine might very well have deodorized my dishwasher, but I couldn’t tell because it didn’t leave any lingering citrus evidence. Not necessarily a bad thing. Last words: Lemi Shine performs as promised at a buck a shot. Thank you, Angela. This is the first Lemi Shine product I’ve used. 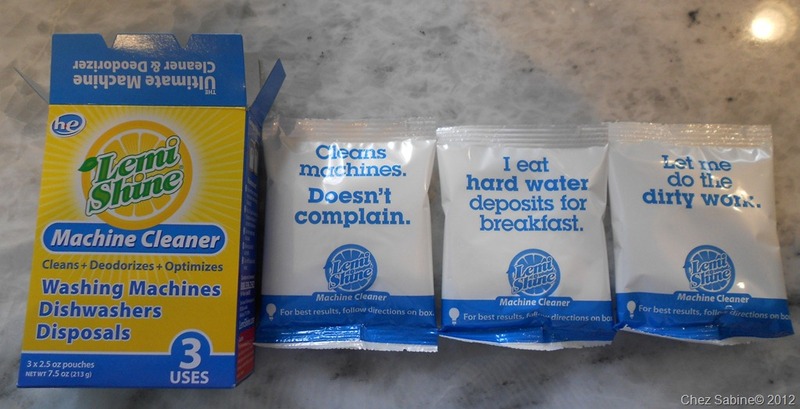 And I’m looking for a detergent that’s a powder or tablet (Fisher & Paykel dishwashers don’t allow for liquid/gels) with phosphates because they’re supposed to help with spotting/filming from hard water. 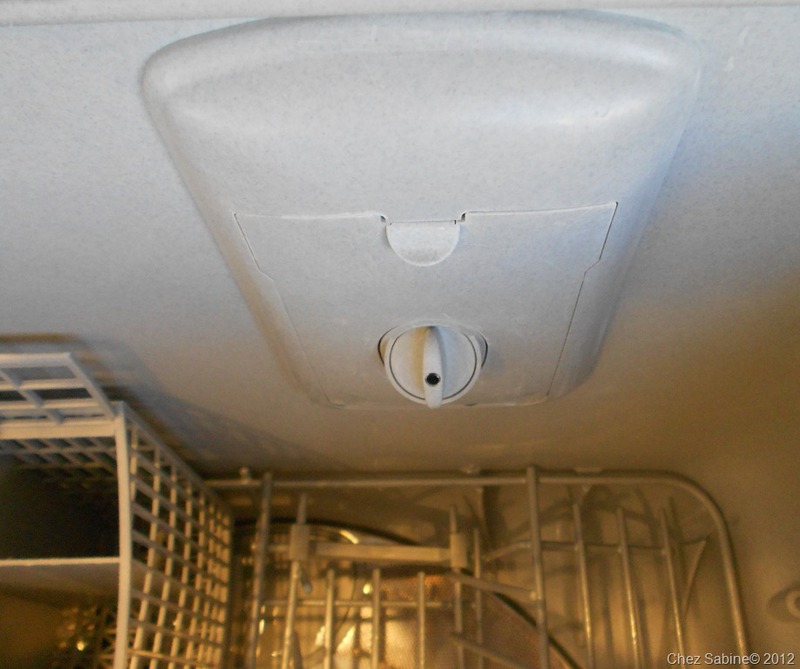 The interior of my machine gets cloudy, and so do some of my dishes. I do use a liquid rinse product. washer soap). Been looking great.! Thank GOD it’s turning cooler!!!! Can’t remember if I told you, but use Baby Oil on my stainless outdoor sink. Juanita, what good luck that I just happened to select Lemi Shine from the shelf without knowing anything about it beforehand. Seems it has a lot of fans. Yes, you mentioned the baby oil. Thanks for that tip. Take care!